Ryder has an amazing ability to relax amongst the chaos around him. I took these photos about 1 second apart. I could have continued but the battery died and you would have been stuck with watching Ryder sleep for 15 minutes. So the dead battery is probably a good thing! Meet Pixel, Amanda’s newest family member. She is the cutest baby corgi I’ve ever seen and definitely the most gorgeous. She usually just plays for a few hours every morning. And now we get to the brat part… Good thing Daisy likes her! Apple always seems to get into these weird and wonderful positions while playing. She keeps all the dogs on their toes because they never know what she is going to do next. It seems to be really hard for 3 dogs to play well together, unless they are playing tug-a-war. That being said, Brodie (shepherd cross), Maggie Mae (lab) and Rudy (cattle dog) did a pretty good job of it… The two boys were both trying to play with Maggie Mae, who in turn did her best to keep them both entertained. We got a new couch the other day. I think they are enjoying it, although it could be a little bigger. Well it has happened… We were full EVERY DAY this week! Phew. With more dogs comes: less time for taking pictures and blogging (have you noticed?) and everyone’s favourite, more cleaning! While we’ve been getting busier, we’ve been doing lots of talking about what needs to change now that we are turning dogs away most days. While we still haven’t found a good solution (I’m not sure there is a perfect one out there), we are getting closer to making some decisions and some changes. You’ll be the first to know when anything changes! 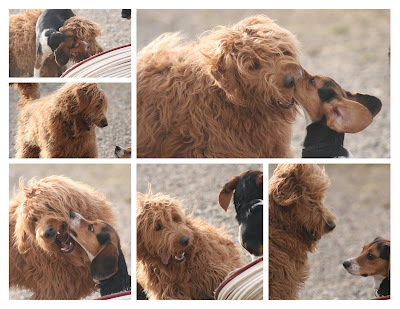 And so this isn’t all dry and boring, I leave you with a cute collage of pictures of Shandi (Beagle) and Rooney (Doodle) having fun. Click on the image to see full size. Sitting still. A rare moment! We implemented a new policy a little while ago – new dogs have to come on their first day on either a Monday or a Tuesday. We do this because Monday and Tuesday are our quieter days and it is easier on the new dogs when there aren’t 35 other wild and crazy dogs racing around. Today we had two new dogs – Kyeli, a very sweet border collie who left before I got the camera out and Maggie, a young westie who didn’t really enjoy having her picture taken – she was too busy making new friends. Have you started preparing for Christmas yet? Well it has been on my mind lately and I started to worry about what Chewy would do when we close the daycare over the holidays. She has never lived anywhere else (well that may not be exactly true, but she was still just a kitten when she was dropped off at the daycare as a stray) but we knew she would be pretty darn lonely even if someone visited her every day. So Chewy had her first adventure in a home. There was a whole lot of hissing and growling going on last night between her and my own cat Lu, but they seemed to have worked out an agreement. As long as Chewy stays out of Lu’s line of sight, they are happy. It is pretty funny to watch Lu walk into the room, oblivous of Chewy and then suddenly spot her. Ironically enough, Chewy just wants to be friends with Lu and will actually try and lay down close to her, but she wants nothing to do with Coulee and Lacey. Maybe she is finally starting to figure out she is a cat and not a dog.